Bryan Singer loves to share. Most of the major casting news on his X-Men films breaks on the director’s social media channels. He knows how to excite fans, but also frustrate them. 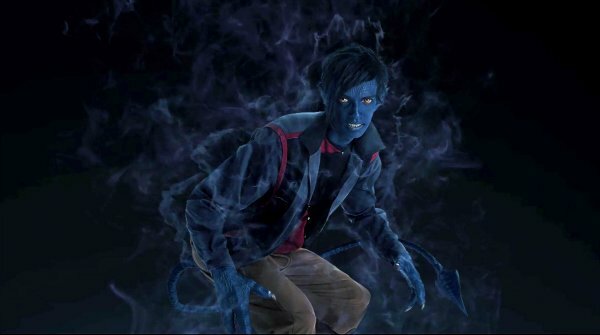 Early this morning, both Singer and Kodi Smit-McPhee shared looks at young Nightcrawler from X-Men: Apocalypse. But shortly after posting, both images disappeared. Thankfully, EW worked quick, posting a brighter version, showing more detail. It also allows producer Simon Kinberg (a noted Star Wars fanatic) to have some fun with decade-appropriate film memorabilia! Nightcrawler, aka Kurt Wagner, isn’t the only "X-Men Baby" making a return to the popular franchise. The director has gone back and reprogrammed new versions of the X-Men "Holy Trinity," casting Sophie Turner as Jean Grey, Tye Sheridan as Cyclops, and Alexandra Shipp as Storm. But he hasn’t stopped there. So many former cast mates will be vying for screen time in X-Men: Apocalypse, starting with original First Cast mates James McAvoy, Michael Fassbender, Jennifer Lawrence and Nicolas Hoult. There are rumors that Evan Peters could return as Quicksilver, a fan favorite from Days of Future Past. Lucas Till recently was confirmed to return as Havok, and Singer cast Olivia Munn as Psylocke, a newcomer to the on-screen X-Men universe. As you can see, the call sheet for X-Men: Apocalypse is pretty damn extensive. We haven’t even dabbled yet in Apocalypse, himself, and the Four Horsemen he’s expected to bring. Singer went ahead and cast the brilliant Oscar Isaac in the role, and we’re praying that the actor’s talent isn’t buried beneath a prosthetic costume, or relegated to a minor subplot because there are so many heroic mutants to tend to. Seriously, we haven’t even talked about Angel or Jubilee, both of whom are expected to appear in this movie. Singer, though, has earned our trust, after juggling multiple threads in Days of Future Past. We’ll see how he manages it all when the movie reaches theaters on May 27, 2016.